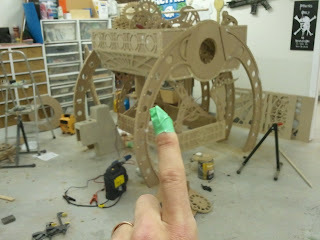 I got to the shop at 7 am this morning ready to start the texturing of the sculpture! I tend to get excited about most of the jobs that come through our shop, and if I didn't need sleep, I would just work all the time. I know that if I won the lottery, I would still make all the stuff we do! 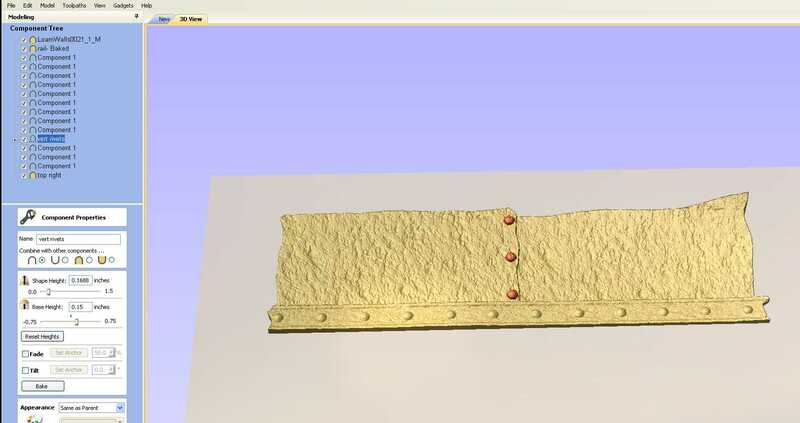 Anyways, I was able to parge all the moldings with Durabond and add a sand coat to the rough stone base. This actually takes quite a bit longer than one would think. 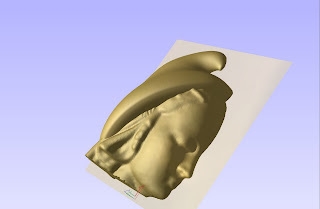 As I was waiting for the Durabond to stiffen up, I worked on the 2 heads at the top of the sculpture. 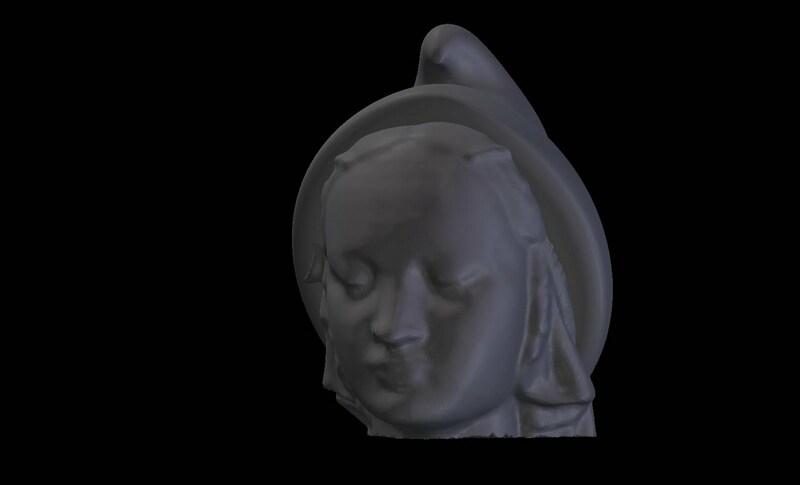 I was able to find a 3d scan of a stone cherub head online. The nice thing about this 3d model is that it has "baby proportions" You know, that chubby face. This works great with our sculpture, as all the figures that were carved in that time were all kind of chubby. I brought the scanned model into our 3d modeller "Hexagon" and added that weird smurf hat that Mithras seemed to wear. 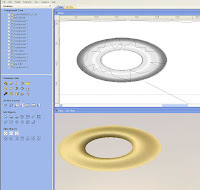 After the modelling was done, I brought the model into Aspire and split it right down the middle and toolpathed both sides. The machining was a lot quicker than I thought it was going to be......40 minutes to rough and finish machine both sides of BOTH heads with a 1/4" ballnose cutter with a 6% stepover. A pretty small stepover for what this is, but it means no sanding! 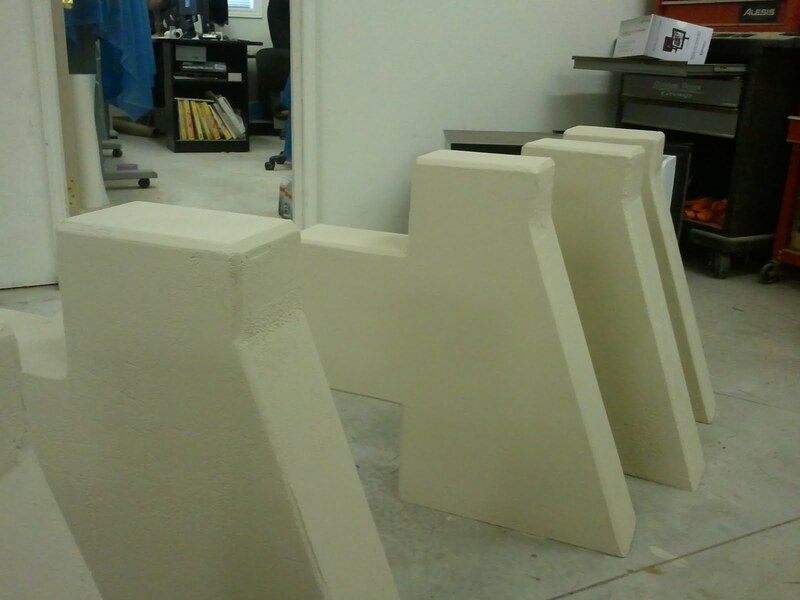 Being that we cut these out of HDU foam, I wouldn't really need a roughing pass, as the material cuts like butter. However, the flute length on the cutter(the spiral part of the cutter that removes the material) was only 1" and our foam was 2" I quickly glued the halves together and texture coated them with what was left from doing the main sculpture. After that, I moved on to drawing up the simple bases that the heads sit on. As I was machining these parts, The storm we were having knocked out the power, leaving our Techno cnc very, very quite and alone in the dark. This really stinks because I wanted to leave the whole thing done, to dry overnight. Oh well, I will just finish up in the morning. This however sets the painting back a bit, but it'll get done. Sometimes things go really quickly! 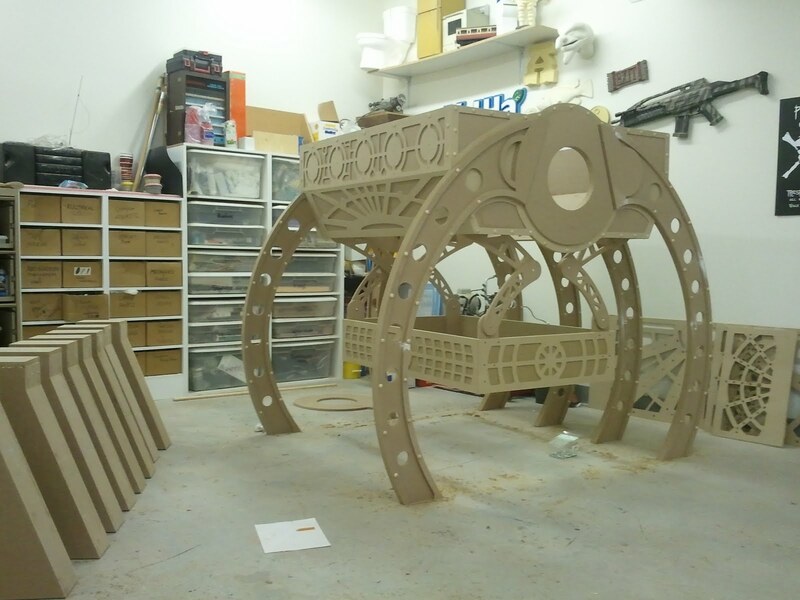 As the Techno cnc was running the 3 reliefs for the Mythraic stone sculpture, I was quickly drawing up the top and bottom moldings that wrap the sculpture. This again was done completely in our Aspire software. It was a pretty simple task for sure. 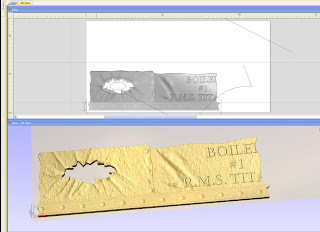 I opened the reference picture and traced the left and right molding profiles. As the reference image was taken at an angle, perspective comes into play, making one side of the molding smaller than the other. After tracing the left and right sides, I morphed them into an average size and went with that. Off to the 2 rail sweep tool for the next part. Having the cross section now, I just needed to "sweep" it along 2 straight vectors. Done. 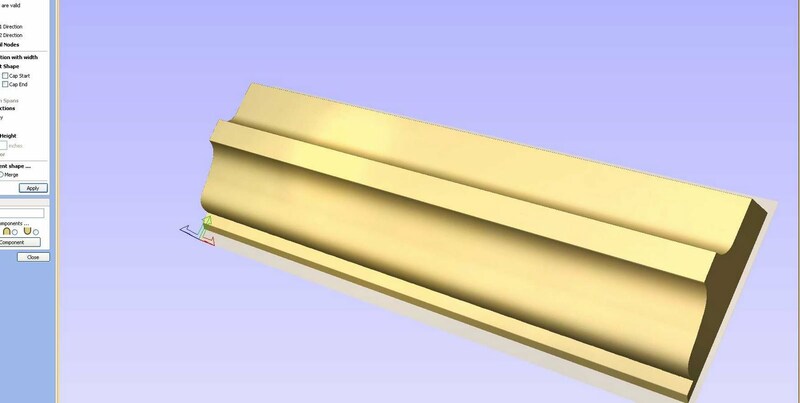 Next I used the same profile to cut the ends, this eliminates the need to mitre the corners. So essentially the front and back molding have the profile on each end, and the side moldings are just cut square, and fit right in between. Our Techno cnc did a great job at efficiently cutting all the pieces. To mill all 3 reliefs 21"X31" (at an incredibly small 6% step-over) and mill all 8 moldings, the time was just under 7 hours. 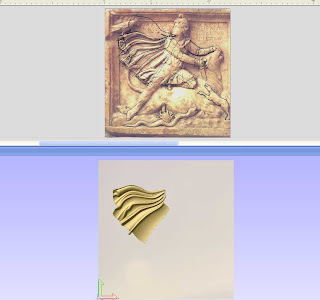 The relief has a lot of vertical edges in it, so this can exponentially slow the machine down. This is due to the X and Y axis having to completely stop and wait for the Z axis (the up and down movement) to get to the height it needs to, before continuing on its way. It's like trying to get to 100 km/hr in you driveway! This being said, I couldn't do it by hand in that time. AND I can do other things while the machine is running. Like stare at it in amazement most of the time! By the end of the day, I had all the parts cut and glued together. I'll let the glue set up overnight tonight, and start with the coating tomorrow. 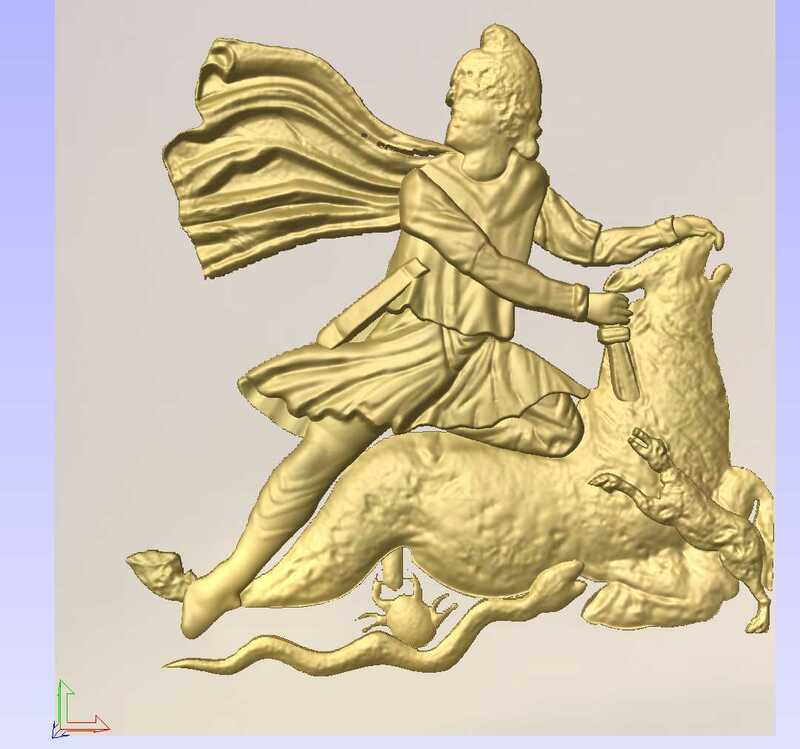 While I am busy with the coating process, the Techno cnc will be machining the 2 small head sculptures that adorn the left and right sides at the top. 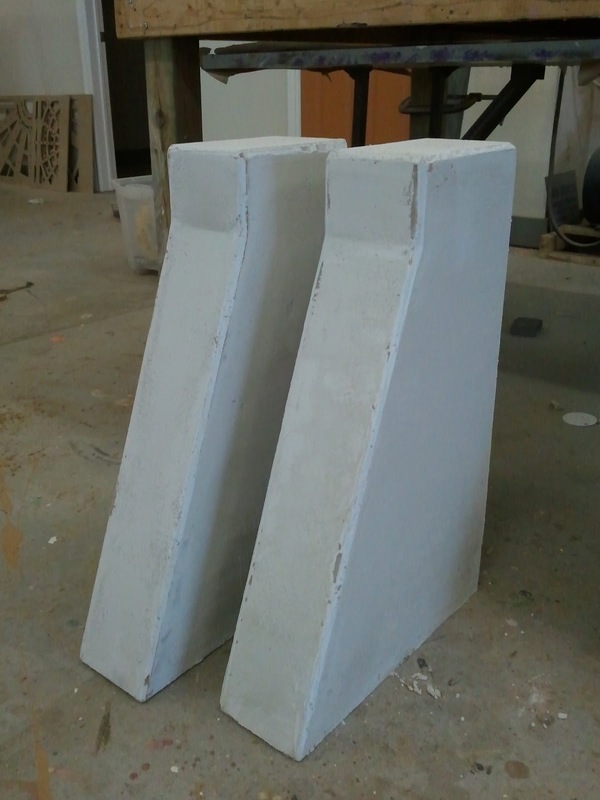 I will probably cut these from 15lb HDU foam, as they need to have some detail to them, and I don't really want to coat them with Durabond. It really is a Death Machine! The Death machine really does work. It seems that a misplaced finger, coupled with the law of the lever and Newton's first law of motion equals........... "!@#$? @" But now it only hurts all the time. 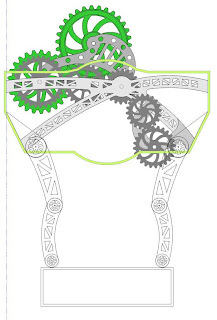 After taking care of all the mechanics, and adding considerably more, I am now re-doing some of the gears to make the machine appear to run in a wonky state of dis-repair. 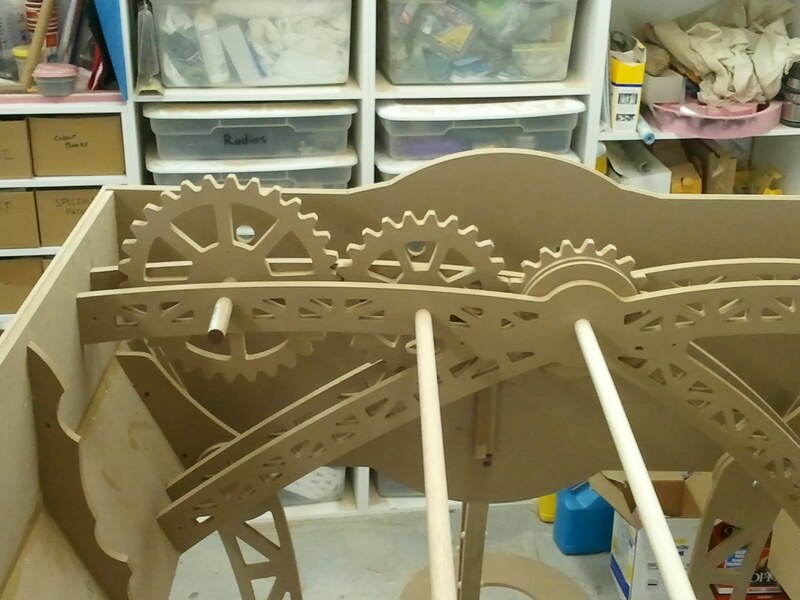 This includes a new elliptical drive gear system that will slow down and speed up the main gear assembly, as well as moving some of the gears slightly off centre, which will make it look a little wiggly. We beefed up the lift system for the harrow platform, and added "steam hydraulic" lift arms to it. Due to all the moving parts that fold in on each other, the harrow has a tendency to swing back from side to side, a tendency I disliked very much. This is the real reason we added the lift arms. They actually just go along for the ride, but they did take the rocking out of it. A little to much so for the age and the condition of the machine. So I intentionally made them bind a little to make the up and down movement a bit more jerky. This should be it for the mechanics of it all. We will have to put this job on the backburner for a week as the Mythraic stone deadline is quickly approaching! Today I dedicated to finishing up all the mechanics in the top of the machine. There was a few specific things that need to happen with this machine, and one in particular had left me kind of stumped. The request was simple, but figuring out a practical way that tied into the machine didn't come easy at first. But I solved it today. It kind of came out of nowhere. 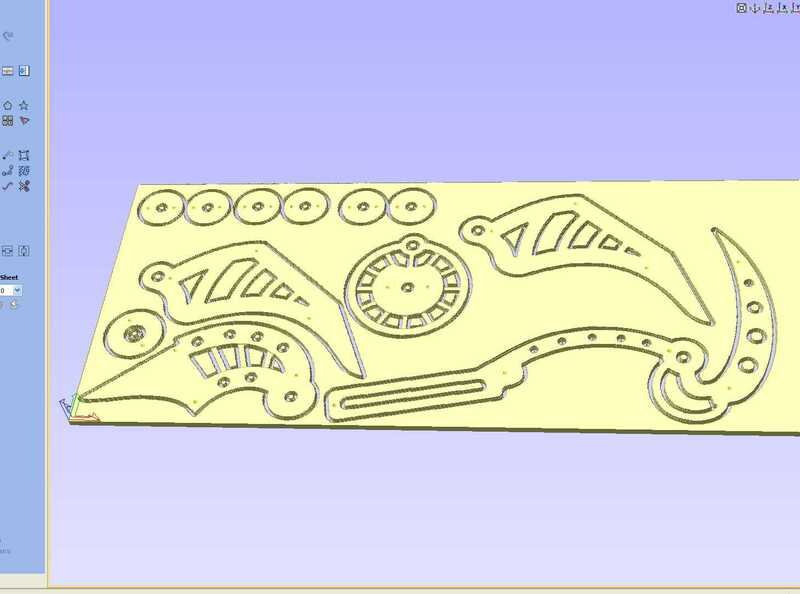 So I drew what I needed in Aspire, sent it to our Techno cnc and had the final pieces for the puzzle. The image on the left is the vector file I created, and the one on the right is what the simulation of the final cut pieces will look like. So between making the last elements, cutting all the shafts to length, making all the bushings and spacers, as well as the locking collars for the gears, the whole day was gone. If you had come in in the morning, then again at 5, it really would have looked like nothing was done. However, a lot really did get done! Tomorrow I get to finish the harrow/winch situation and add a new pulley idea I had for it. If the weather's nice out, Jody will start the weathering on the pylons. It can be a little messy, so outside with her it is. Soon.......soon we will be painting rust! Today was a little slower than I would have liked. Between the dog not pulling his weight,(see last post) and engineering new gears for in the top of the unit, I didn't get much actual fabricating done. Jody got the concrete pylons coated with the first of many paint techniques to come. 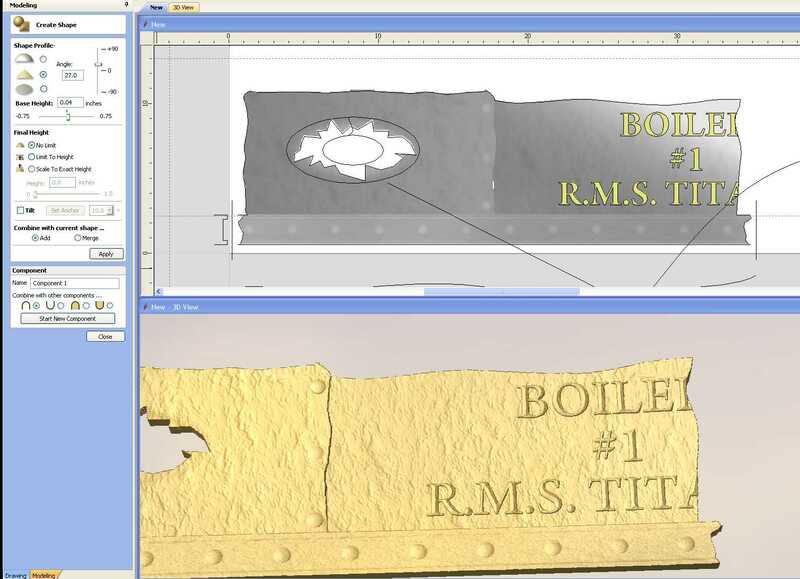 This is definitely one of those jobs I would have never taken on as Prop shop WITHOUT our Techno cnc. As there are a LOT of gears and mechanical things happening on the top of this unit, I find it a little hard to wrap my head around how it will all work when it's done. This, for me, is one of those jobs that I will build the first set of mechanics, get them all happening, and then design the next set of mechanics to it. 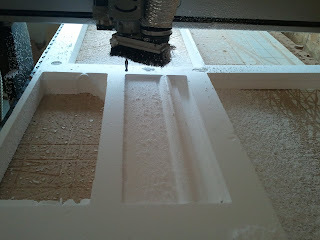 With using Techno cnc routers and Aspire, I can easily pull up the last set of drawing we machined, and add to it after getting a feel for the real world dimensions when they're placed into the machine. Something next to impossible the old school way. This is where we are now in the drawing stage. The whole design is supposed to look overly complicated and somewhat inefficient. When the machine is done, we will have a 12 volt ATV winch lifting the harrow, and a second motor driving the rest of the gears the whole time the machine is "running". It's gonna look great when it's all rusty and old and moving. I have decided tonight that I will drive a set of pulley's off the main motor, which will belt their way down to the harrow, so it looks like all the gears at the top are driving the tattoo needles in the harrow. I really like this machine, and it certainly is a design challenge! Once we cut all the shafts to length, and add the appropriate bushing/spacers, it will all be pretty sweet looking. Well we got the coating on the concrete pylons today! Woo-Hoo! While we were doing that, our Techno was busy quickly cutting out more gears and brackets for inside the top of the machine. As the gears get put on the machine, I find new spots that could benefit from more gears, which means more brackets to hold them. 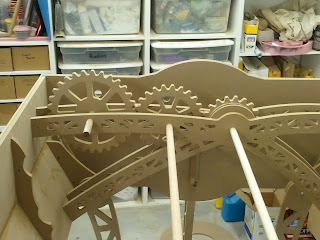 As all the gears are just for show, and really only turn each other, I have some degree of flexibility. Except for the fact that I want to drive them with as little motors as possible, preferably just one. Although WE were hard at it, some of us just didn't seem to have the same sense of urgency I did. 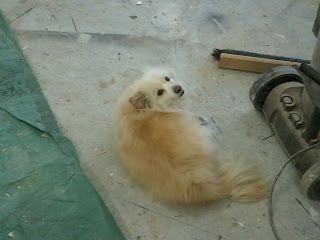 I thought if I tied a broom to him, he would feel like a part of the team, but I was mistaken. Tomorrow we can move onto painting the bases and pull together some of the other elements. 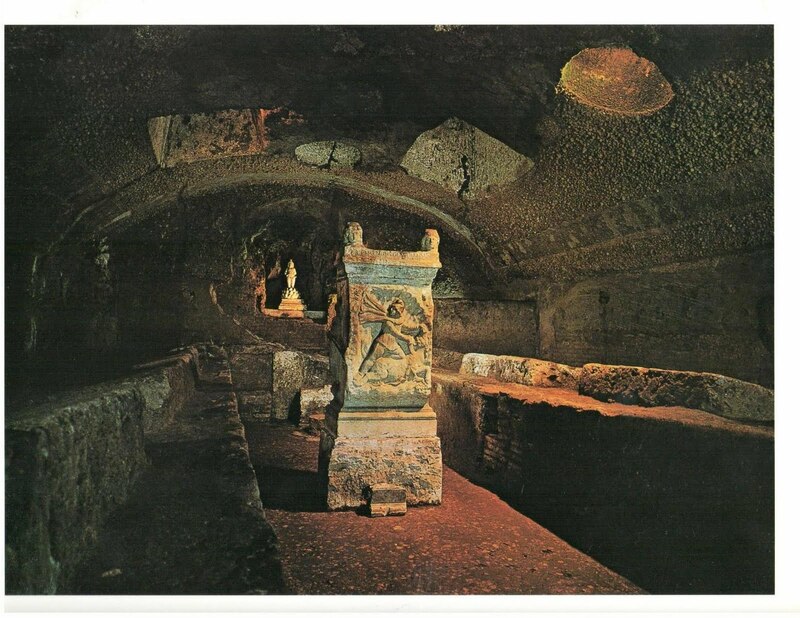 As soon as our Techno is free, I can get the foam on it for the Mythraic stone sculpture. That would be nice. Today went well on the death machine. Mike was in again today, and that really sped things up. Mike's an easy going fellow, and we have a fair amount in common, which really makes the day go by quick. We were able to finish the support legs and get more rivets on. The harrow got assembled with the arms that it hangs from. 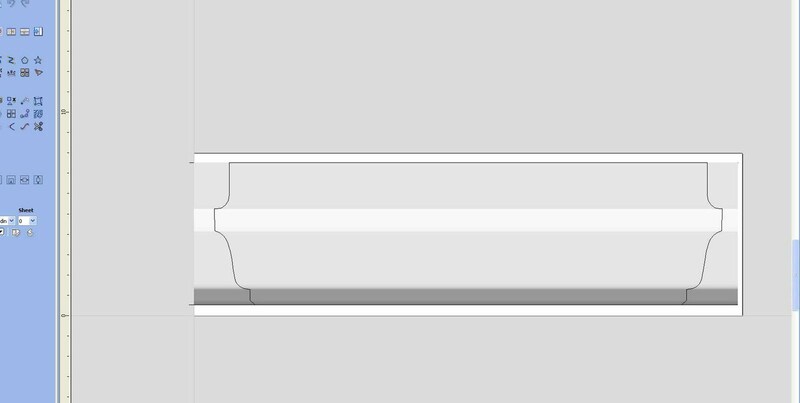 This is the part that will have the animated tattoo needles going up and down. We didn't get the concrete parging on the pylons done, We'll probably start on that tomorrow. 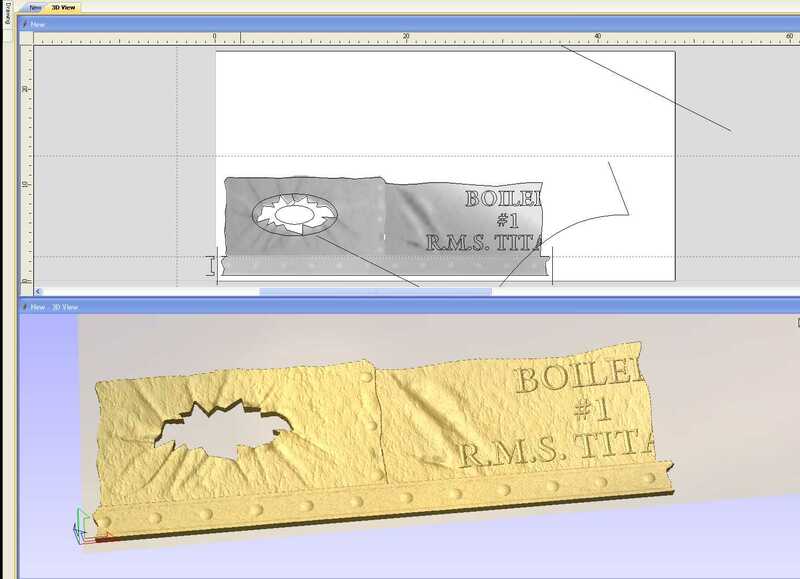 When I started the design, I found a cnc file for a mechanical iris on the Vectric website (I don't remember who posted it, but if they let me know, I will credit them). This is where your punishment will be fed into the machine with old school punch tape. It's a pretty cool design, and should look great on the front of the machine. the whole time we're building, all I can think about for is getting to the texture and painting stage. This is where it all comes to life! I know, another riveting title! I WILL NEVER get tired of the Death references. Well we started making headway with the jumble of un-named parts today. We were able to start assembling the upper portion, as well as the "metal" leg supports. It did take me a while to sort out some of the support edges, but I got it finally.. We also had to remake one side of the harrow, as I put the laminated plate on backwards, and as it was 1/4" MDF it gave up the struggle with a "snap". I also got all the column bases cut out as well. All in all it was a very productive day. I am quite excited about starting up again in the morning. I am very fortunate that I get to work on all kinds of neat projects for a living. It keeps it interesting, especially because I get bored so easily. Tomorrow, we will work on parging the compound 90 onto the column bases, transforming them from MDF into cast concrete. Say that really fast. Yesterday we had a meeting for another upcoming feature film. Due to non-disclosure agreements however, I am not allowed to mention any details or plot lines etc. I can however, talk about the specific part we're making. 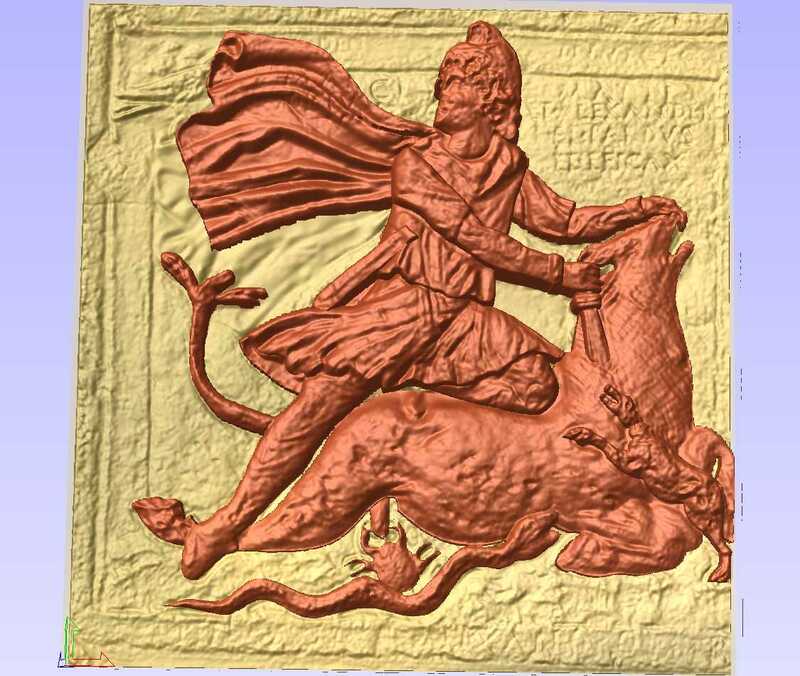 We will be fabricating a 6 foot tall Mythraic stone sculpture of the God Mythrias slaying a bull. We received some pictures from the art department, and I also did a ton of Googling to find out as much info as possible. 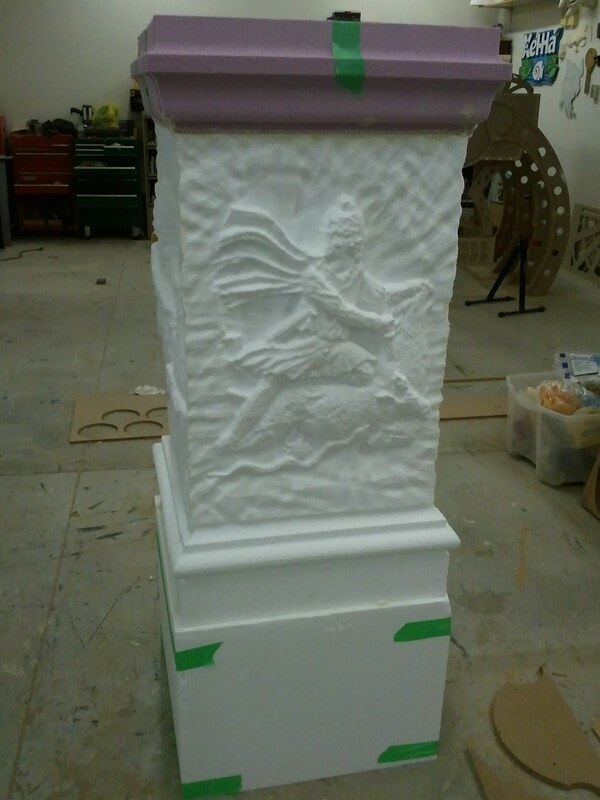 This will be the first digitally sculpted relief completely built in our Aspire software. I weighed the odds of poly-modelling this in Hexagon, but the ability to draw my vectors right over the downloaded image in Aspire was WAY easier, especially as this is a bas relief. I won't detail every single step, as all the steps are so similar to each other. To start, I opened the image in Aspire, and started to break all the parts like hands, arms, legs, animals, etc into separate vectors. Just by tracing the profile of them with the line tool. I quickly massed the shape up by using the create shape tools, using all domes for the most part. The only exception was the cape. As the definition of the wrinkles was very easy to see, I used the 2 rail sweep function. I did each wrinkle separately to allow full control when merging each wrinkle component together.I would bounce back and forth between the various tools, including the sculpting tools, to achieve the look I was happy with. As this is the first "Aspire only" model I have done, it started slow for me, but rapidly got quicker. I could probably re-model it in less than half the time now! 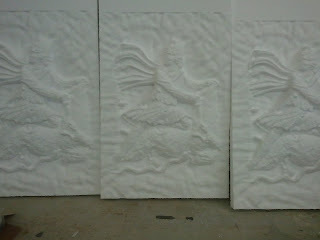 When the whole relief was finished, I added the original picture, as a texture, over the whole relief. This gave me the enhanced stone look, as well as all the little details that would have taken a vast amount time to model. 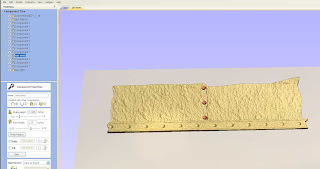 The next step was to model the strange recess that the figure is set into. 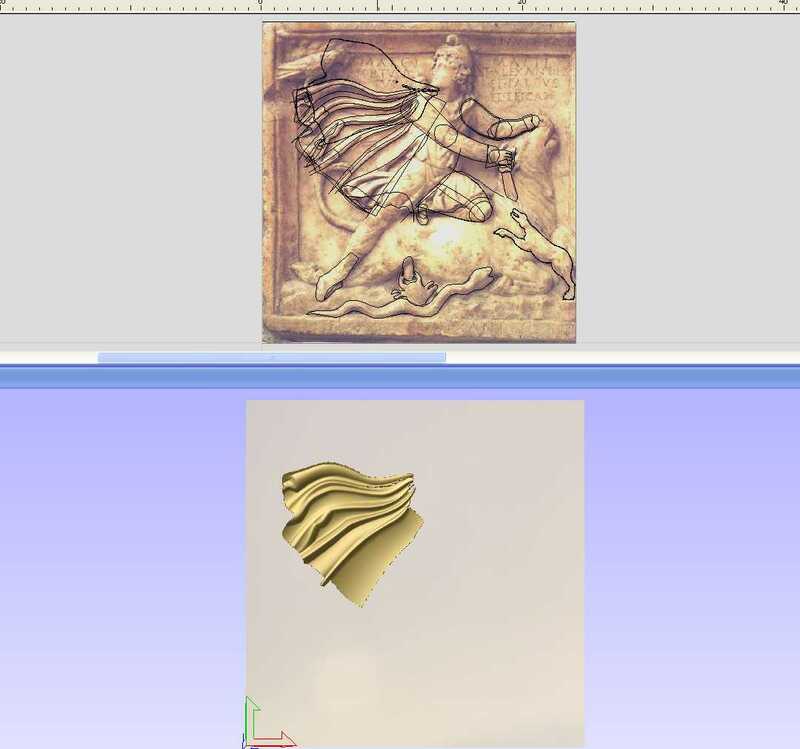 I opened a new file, brought in the image of the actual monument, and traced the recess opening. I added a negative relief with the dome tool. Did a bit of sculpting and smoothing and voila! 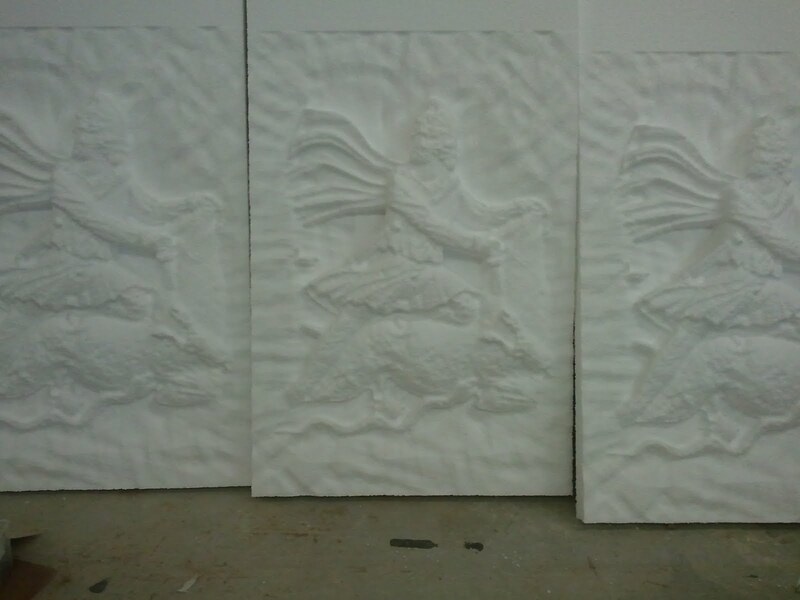 The next step will be to add a rough texture to the background and merge the two reliefs together. It will be a blast to watch the Techno carve this bad-boy out. The relief is on 3 of the 4 sides. 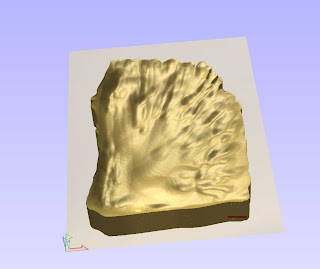 This is why we switched over to digital sculpting and cnc. Once the file is generated, we can scale, stretch and duplicate it as many times as required. To move slightly off course for a moment, I wanted to post a little bit about the things that work right. We all have been through it, we buy a computer upgrade part that when we get it home, it needs something else. Remember when printers were making the switch between parallel port to usb? Or you wanted to move to Win 7 and your pc (which seemed fine with XP) couldn't handle it. As I am also a closet computer nerd, these things would pop up from time to time, and drive me batty. 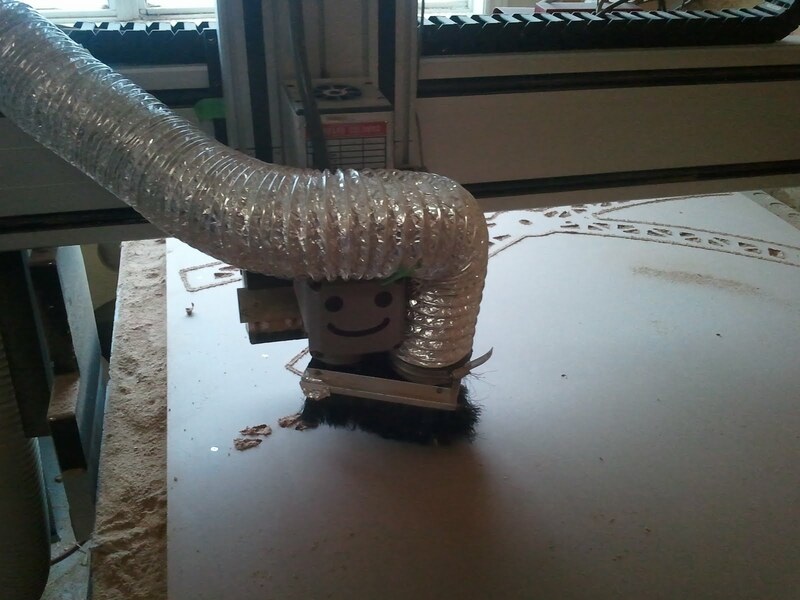 I remember my old cnc routers. When I got my first one, it was running win 95! As I was running win XP, I really wanted to upgrade the router. I could do an upgrade, but it was gonna cost me $5000.00 for new electronics and I would be stuck with the old mechanics of the machine. Fast-forward to now. I purchased my Techno cnc 2 years ago, used. I would guess the machine to be between made between 1999-2005. I recently picked up the ART hand held pendant from Techno. This is a fantastic piece of technology. It basically provides complete control of all machine functions via a small touchscreen monitor.It also allows me to move around the machine and do all my set-ups where they need to be done, instead of commuting back and forth from the PC to the machine. So this is where I am going with this. I was able to download the drivers from the Techno cnc website, plug in the ART pendant and it all just works. Period. No expensive upgrades, new components or computer changeover. It just works. A new piece of technology-working in tandem with my older machine. I think the developers over at Techno need a round of applause, or at least from me, because this is the way it always should be. Or at least all the parts for it are! I finally got to cutting some of the bits and pieces for the Death machine today, and I hope it all comes back to me when we start to assemble. There are a lot of pieces that don't differ all that much from each other. When I nested all the parts in Aspire, I had grand plans of keeping the pieces that went together in some sort of grouping. That approach quickly went the way of the dodo as I would sneak a piece from there and put it in here, to get the best sheet yield. Almost all of the structure is going to be 1/2" MDF, due to the cost vs quantity of all the parts. Our Techno made SUPER short work of cutting it all out. No more than 18 min per sheet. I could have easily halved that, but I can be a bit of a baby when it comes to cutting sheet parts, playing it safe, rather than pushing feed speeds on the Techno to hard. I ran all the parts with 2 passes. The first one was at .4" and the last was .5" As I dont have a vacuum hold down yet ( but the router came all plumbed for it) I have to resort to screwing my sheets down. As a lot of the parts were skinny strips, I have found that taking a deep first pass, leaving only a small amount for the final pass, results in less pulling on the part by the cutter. I also have found that running a parallel cutting bit over using a spiral cutter creates a better edge on the MDF parts. I thought that for this post, I would take a few moments to discuss the single most important tool in our shop, as our next few jobs are still at the early computer stage. When I started using cnc routers, I had no idea the creative potential I could unleash. I had very little computer experience, and I thought vectors and .STL must have been some kind of government agency! At that time, Aspire software wasn't available. I had bought a used camtech router which was cable and chain driven(that's right, you heard me) and the pc (win98) came with a copy of Artcam 5. The machine software was running in a DOS shell and was VERY limited by today's standards. None the less, I was very happy at the time. I think I paid $2500 for it. The cost was the only reason I was able to move to automation at the time. I had no tech support, as the machine was out of date, and the cost to upgrade the mechanics was WAY out of reach. I learned quite a lot about this new world on that machine, but as time moved on, It became apparent I needed faster cut times. That machine had some seriously under-powered stepper motors on it. Not that steppers are bad by any stretch, I have heard of steppers that can shear a 3/8" cutter off without stopping. But UNDER powered steppers gave me a world of grief. I then actually found another used camtech machine, fairly well priced, that I purchased as well. Being that I already knew how to use our first machine, having a second one that ran the same control software meant no steep learning curve....again! I ran both those machines for about 2 years. One was 4X8 and the other was 5X10. Needless to say, that's a huge amount of real estate to lose. As more and more work started to arrive, I found that 2 under powered machines were not going to cut it. Secretly, I wouldn't take some jobs on, as I couldn't count on their accuracy. If you compound under powered machinery with an open loop stepper configuration, the combination can be disastrous. I sometimes would let those machines run when I went for lunch, and would come back to a pile of lost steps, parts cut through other parts, etc. Time was another factor. It took our one machine 10 hours to 3d machine a sci-fi machine gun out of MDF. And that was just one side. Still though, it was faster than doing it by hand. Those machines did carve a lot of great stuff though:) As time went on, I knew if I wanted to stay in the cnc business, I HAD to upgrade. I spent hours online looking at new machinery, I would attend woodworking and sign shows, learning all about what was out there. I finally decided to go with a Techno cnc router. I chose them for a multitude of reasons. Largely for the closed loop servo motors. In a closed loop system, the servo motors are always talking to the computer, letting it know where they are at all times, and correcting any errors on the fly. The other is the LIFETIME support. I bought my machine used from a fabrication company. Even though it was a used product, I have received software and firmware upgrades for free, as well as unparalleled tech support. I used to read on some forums (after I bought my machine) that Techno's tech support was terrible, I have from day one never found this. In fact I have Mike from Techno (i think that "from Techno" might even be his last name) in my cell phone speed dial, just in case I need help. Our Techno has run miles of cuts, quite literally. I do a small amount of maintenance, like lubrication and cleaning, and that's it. Compared to our last 2 machines, the maintenance is minimal at best. 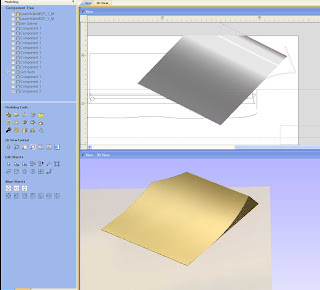 I will, at a later time, answer some questions and myths regarding cnc routers. But for now I need to finish drawing up our up-coming projects. Oh yeah, That same sci-fi gun, cut on our Techno took 45 min. a side to machine. Which means that our Techno can outrun the old stepper machine by making 13 full guns to 1. With that ratio, you can see what makes sense! I have been furiously designing all the components for our Death Machine. I thought I would get tired of using the term Death Machine, but it still makes me laugh. Death Machine................Death Machine. We had our meeting on Tuesday to go over some of the concerns( you know, concerns with a Death Machine) and we are good to go! The great thing about this job is that we have a few "key" components that have to be met, but the rest is up to us. I really enjoy designing on the fly, as some things really do come out better I think. I have been doing all of my vector work in Corel for this job. I could have easily done this in Aspire, but as I started out using Corel back at version 8, I find it suits my workflow on this sort of thing. I am in the process of migrating fully to Aspire, but old habits die hard I guess. I can hardly wait to fire up our Techno cnc and start filling the dust collector. This job definately has all the great features in one job. From doing the creative design and the technical drawings, to the artistic parts like texture rusting and concrete weathering, this project will be fun until the end. I think the best part of all is that they might use a location down the street for filming. Nice................up at 6:55, on set at 7! We have been slowly working on a couple of projects here at Oxenham Design. Both are in the design stages and are for 2 separate movies. So the next bunch of posts will bounce back and forth. The first one we are fabricating is a Death Machine! 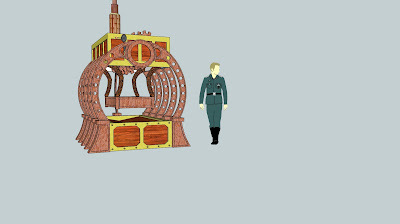 This machine will be influenced heavily by the Steam-punk movement. In a nutshell, this old rusted machine has it's victims strapped down and slowly tattoos them to death. There will be a harrow that has 100's of tattoo needles that slowly tattoo your crime onto your body, until you FEEL your sentence in your soul. That sounds like something I got to have. We started the initial designs in the 3d modelling program Sketch-up, which is great for quickly massing an idea out. The next few weeks will be spent figuring out what exactly is going to move and how. 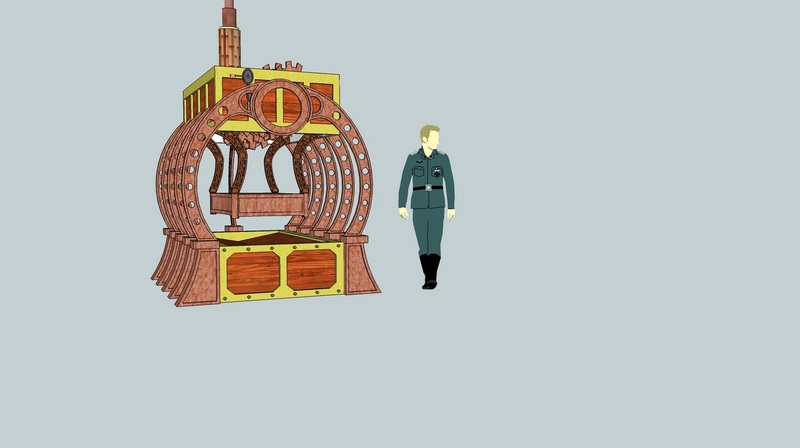 At the end of the movie, this machine needs to "break down" and collapse on it's victim. This will also be a big design challenge, having it look like it's breaking down, but still staying quite safe. Safety is always first priority. There will be lots of rusted gears and pipes, my favorite. Below is the initial design concept, and you can see the harrow in the middle. 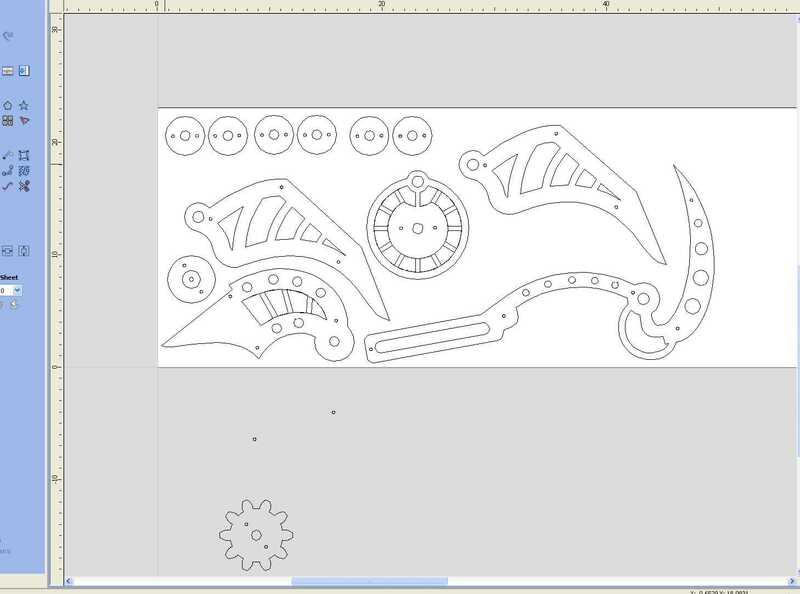 I think we are going to have the tattoo needles attached to a simple crank-shaft design. This should allow an entire row of needles move off of 1 drive unit. At this point in the design, the components don't really need to function. It's more about massing and design. After the final approval, we can get started. I can hardly wait to have a Death Machine just outside the office. I thought that one of the panels should have a curve to it, it would be a little more interesting than just a flat panel. Back to the very important 2 rail sweep function. 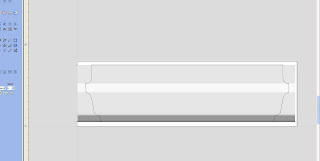 Just like always, we need 2 drive "rails" and 1 cross section that we want to drive down the "rails" You can see in the picture below, the pink dotted lines I will use to create the new component and its results. Once that shape was complete, I just selected the vector outline of the textured panel I created earlier. Hit the "clear area outside vectors" and now my original panel shape has the new curved surface! I also decided a perfect rectangle panel was a little boring, so I adjusted the rectangle borders to make them all wavy. It would have been easier to just draw them this way in the beginning, but Aspire is so flexible and quick, you can manipulate the individual parts at anytime. This keeps the creativity flowing by allowing you to design by the seat of your pants. I also liked the idea of having more rivets looking like they were holding the seams together. Instead of drawing new vector outlines and adding a dome shape, I just select 1 rivet from the rail, and copied it 3 times to the new location. 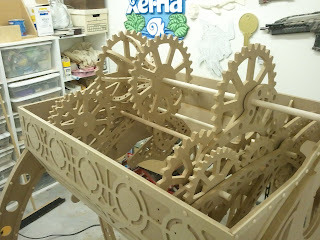 You can see the results of all the parts coming together very quickly. It still needs some more interesting stuff though. I know.............maybe a punched out, raggedy hole. Another job for the 2 rail sweep! 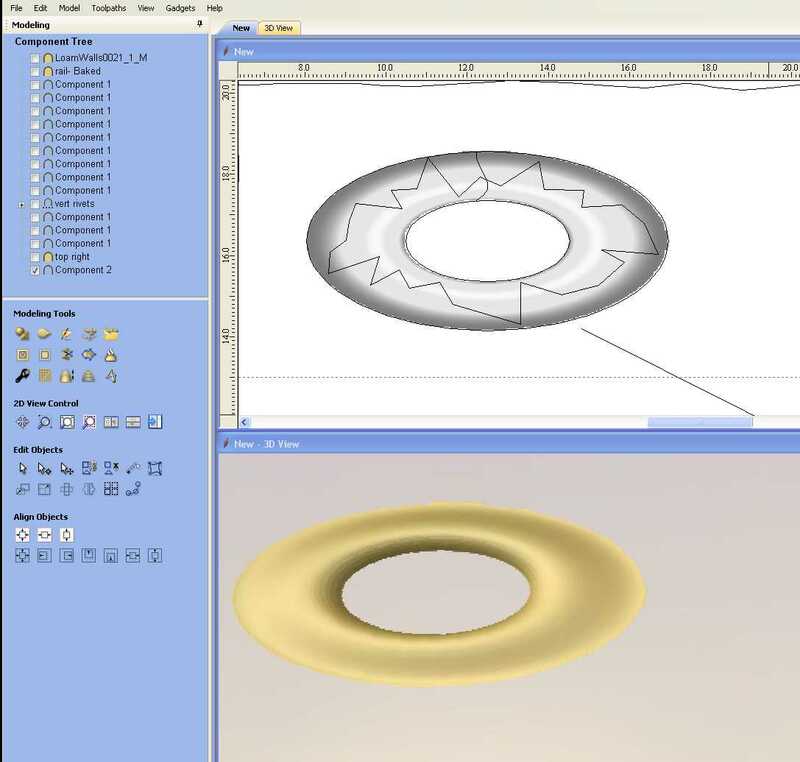 2 offset ovals and a cross section later, I have the underlying shape for my hole. I also drew raggedy outline of what the hole opening would look like. 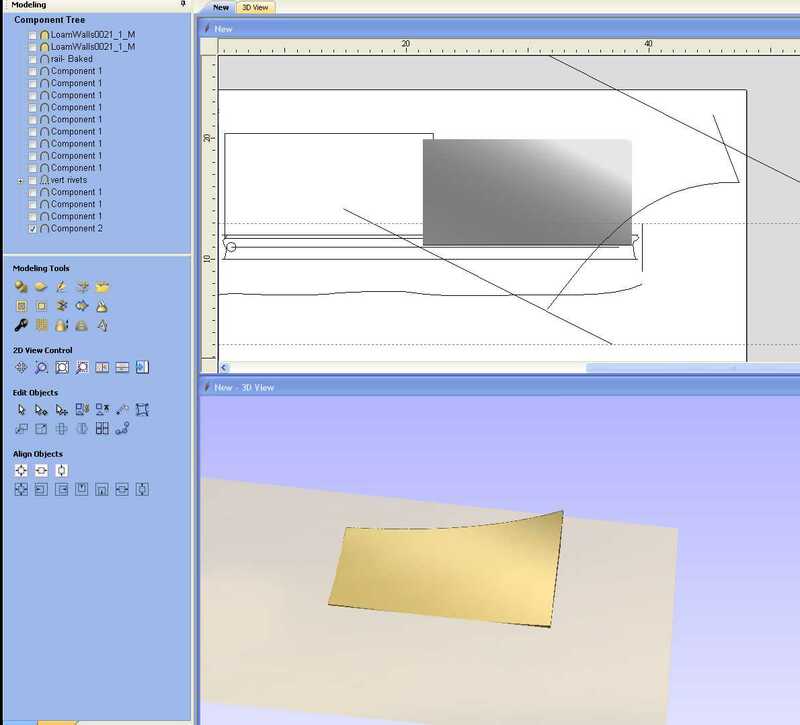 Clear the component inside the raggedy outline, and there you have it. Now to identify what this panel might be. I came up with some text, and added a prism effect with the create shape tools. Now this piece of metal makes sense.The hole on the left still needed some work, so I used the sculpting tools to add some dents and such. I think this panel is done. With being able to control every aspect of this design, including how all the components merge/subtract and add, as well as all of there individual heights, The freedom is endless.